Approximately 4 million people in the UK suffer from Dry Eye Syndrome. The symptoms of dry eye can be aggravated by prolonged visual efforts such as reading, working on the computer and driving. Environmental factors such as low humidity, air travel, heating or air conditioning and contact lens wear can also contribute or worsen dry eye. 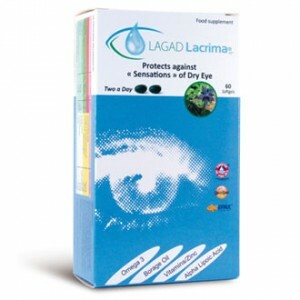 Lacrima consists of antioxidants, vitamins, minerals and essential fatty acids to improve the nutrition of the cornea and maintain the comfort of the tear film. The formula for Lagad Lacrima was developed based on the work of Ophthalmologists and Nutritionists who specialise in research on dry eye.